Uncover a whole new world! Captivating Discovery Education (TM) video and stimulating global topics engage teenage learners and spark their curiosity. 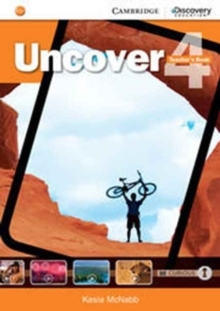 The Uncover Level 4 Teacher's Book includes interleaved lesson plans, audio scripts, answer keys, extra practice activities, tips for mixed ability classes and CEFR mapping by unit. Developed in partnership with Discovery Education (TM), Uncover combines captivating video from Discovery Education (TM) and stimulating global topics to motivate students and spark their curiosity, fostering more meaningful learning experiences. Guided, step-by-step activities and personalized learning tasks lead to greater speaking and writing fluency. Progress monitoring tools and flexible teaching support, including graded tests and extra practice activities, ensure every learner can achieve success.